Through the miracle of Facebook, I have reconnected with a friend of mine from my high school days in Kentucky, who has become a nurse practitioner here in Vancouver. Rosie is employed at the BC Cancer Agency and she was kind enough to show me around the facility, answering my questions about cancer care in this government health care system. Rosie works with the oncologists assessing how brain cancer patients are responding to treatment (like chemotherapy or radiation). She reads brain scans and has the authority to reorder treatments, prescribe medications, and is also involved in triaging to make sure patients are seen as quickly as possible. The BC Cancer Agency has 6 major centers throughout the province. 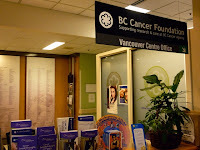 When somebody has cancer in British Columbia, this is where they come. So Rosie is really at ground zero in the treatment of cancer here. OK, I could talk about the beautiful modern facility and the roof garden with the lovely view but I'll cut to the chase. What we all want to know is when folks here are diagnosed with brain cancer, do they get the same quality of care through their government health plan as we do in the US? The answer is yes. The first line of treatment is just the same here as it is for people in the US who have good insurance. Patients with brain cancer and other serious illnesses are seen and treated right away. The initial therapies for brain cancer are just the same. I checked this out with my friend Jennifer, who is an oncologist in the US. Her reaction was, "Basically the system in Canada doesn't allow doctors to do completely crazy things." According to Jennifer, doctors in the US sometimes decide to try courses of treatment outside of clinical trials for which there is no evidence of benefit. I was surprised at this because US insurance companies are not noted for being overly generous in covering experimental treatments. Jennifer said, "Sometimes insurers understand what they are covering, sometimes they don’t, and sometimes they decide not to cover it after the fact." Which, of course, leaves the patients to pick up the tab. I asked Rosie for examples of treatments (effective ones) that patients often want but are not covered by their system. She mentioned Avastin (bevacizumab), which is a drug that can slow the regrowth of the cancer for some months and improve the quality of life for some patients. In the US, the FDA approved Avastin two years ago for treatment of glioblastoma. For those who can afford it. It costs something like $117,000 per year, although patients rarely live that long. As it turns out, in the time since my visit to the Cancer Agency, Avastin has, in fact, been approved now in British Columbia for the treatment of glioblastoma. Another example of a procedure some patients want that isn't covered is having a brain scan after just one cycle of treatment. This isn't really so useful, but patients often want a scan immediately because they think they are going to be able to tell how the tumor is doing. Typically scans are done after two cycles of treatment in BC. If a patient wants a scan done after just one cycle, they can pay to have it done in a private clinic. Upon consulting Jennifer, I found that doing scans after two cycles is also standard in the US. So what about the Canadians who want to come to the US for cancer treatment? There are sometimes treatments that the Canadian health care system is willing to pay for but are unavailable in Canada. Under those circumstances a Canadian's treatment in the US is covered by their Provincial health plan. Once again, keep in mind that Canada is a much smaller country than the US. And remember, here in the US, sometimes people travel to another state to see a doctor who is considered the foremost authority on a particular condition.